Almost 40 years ago, the Apollo 8 astronauts took this famous photograph of the Earth above the horizon of the Moon. 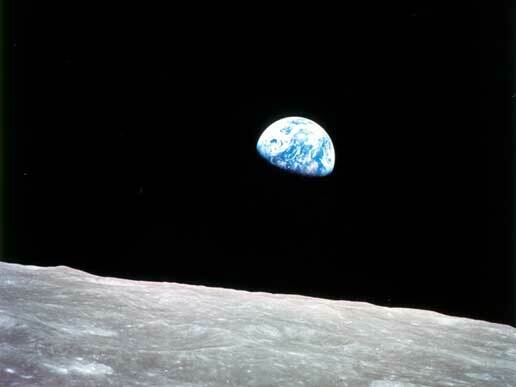 Eventually entitled “Earthrise,” the December 1968 image was a Christmas greeting from the first humans to leave near-Earth orbit and visit another celestial object. It became an icon of the late ’60s, appearing on T-shirts, posters and greeting cards. Space enthusiasts loved it, since it gave earthlings their first real glimpse of what space travel might look like. Environmentalists loved it, because it showed “this island Earth,” a small blue sphere in the dark of space, the only home to humans (that we’d better not muck up). This one also ended up posters and greeting cards. NASA should have demanded royalty fees on these two; they could have funded another Moon landing! It’s been a long while since anyone walked on the Moon, or even orbited it. The Apollo program petered out in the mid-’70s, and manned space exploration has receded from the public consciousness. The Space Shuttle program, except for two fatal catastrophes, has made space flight about as exciting as watching Greyhound buses leave the station. The International Space Station meanwhile whirls above our heads with a small crew who do who-knows-what, since the regular media rarely pay them any attention. Maybe these new images from the Japanese probe Kaguya, which is now in polar orbit around the Moon, will become as popular as the Apollo ones. While no human is on board, the images’ fields of view make Earth seem even tinier and more remote than the Apollo shots. Space is really, really lonely, when the nearest sign of civilisation is 384,000 km away. To be scientific about it, watching Earth rise and set over the Moon can only happen in orbit. The Moon is tidally locked to Earth, so that one side always faces us. If you were standing on the nearside, Earth would appear to remain roughly in the same spot in the sky. Its elevation above the horizon would depend on your lunar latitude. Farside visitors would not see Earth at all. In that tidal lock, the Moon takes about 27 days to orbit Earth and the same time to revolve around its own axis. So the sun would spent about two weeks above the horizon and about two weeks below – a long day and a long night, literally. With no appreciable atmosphere on the Moon, sunrises and sunsets would be not be highlighted by pretty colors in the sky, as on Earth. The Sun itself would also not change color. But, on those occasions when there is a lunar eclipse, lunar residents would see a terran eclipse: Earth interposing itself between Moon and Sun, the sun’s light leaving a red halo around the darkened Earth. Now, that would make a pretty postcard! The Planetary Society has a page devoted to images of the earth taken by Apollo crews and several unmanned probes over the decades. You should check it out.